David Hogg, one of the Marjory Stoneman Douglas high school shooting survivors who has become extremely recognizable in light of his activism, demonized Sen. Marco Rubio (R-FL) for his NRA campaign contributions at the March for Our Lives rally Saturday in Washington, D.C. It had to be high on Hogg's list - it was the first thing he mentioned when he stepped up to the podium on the National Mall. Hogg, however, is not the only Marjory Stoneman student to try and trash Rubio's integrity. At a CNN town hall last month about guns, his classmate Cameron Kasky told the senator that he could not look at him without thinking of the AR-15, the firearm used by the school shooter to kill 17 people. "It's hard to look at you and not look down the barrel of an AR-15 and not look at Nikolas Cruz," Kasky said. Another student, Sarah Chadwick, even suggested Rubio's name be engraved on the gun. Knowing that the March for Our Lives rally was likely to feature more of the same incendiary language against him, Rubio nonetheless commended the young people for exercising their First Amendment freedoms. 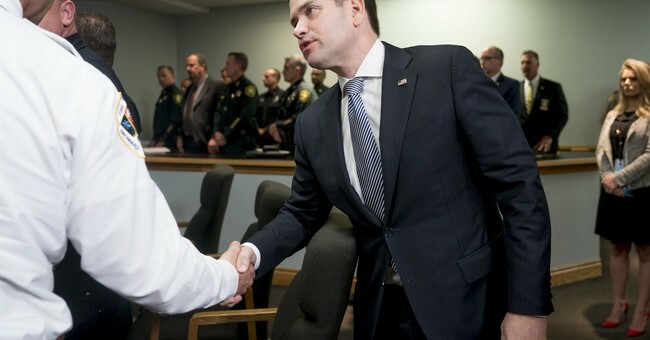 Rubio, as mentioned in his message, has been hard at work to enact bipartisan legislation that would do much to buoy school safety and schools' communication with law enforcement. The STOP School Violence Act is a first step that is supported by the majority of families who lost a child in the shooting. Hogg wouldn't share that with the marchers because he is apparently more interested in attacking Rubio's character. CNN's Alisyn Camerota also recently mischaracterized Rubio by suggesting he was more interested in legislation related to daylight savings time than school safety. Matt cleared up that false narrative and Camerota eventually admitted her mistake. Kyle Kashuv, one of Hogg's classmates, is one of few students noting Rubio's efforts. He was "pained" to see his classmates tarnish his character over the weekend. "Every single senator that I’ve spoken with does not want to see this happen," Kashuv said on CBS's "Face the Nation" Sunday. "I spoke with Sen. Marco Rubio. He cares so much about this, and it pains me to see how he’s being represented in the media." Kashuv wholeheartedly supports the STOP School Violence Act. He has also challenged Hogg to a debate on the issue, which has thus far gone unanswered. Polling may win the debate for him, however. In a new USA Today survey, less than half of students ages 13 to 17 "think tightening gun laws and background checks would prevent mass shootings." The real culprit, Kashuv has argued, is a failure to address mental health and a failure on the part of law enforcement and the FBI to act on red flags.